If you need to bring more (and better) love into your life, whether to attract or to harmonize a romantic relationship, whether to clear the space after a break-up, you should probably work on Feng Shui for Loving Relationships. Why shouldn’t you take into account all the helps you can get? Let the Chi energy flow into your house and be open-minded to embrace it properly. So, take a look at our tips and prepare yourself to feel loved. Besides clearing clutter – the most basic tip to Feng Shui any given space – you should be within the right spirit to Feng Shui for Loving Relationships. Regarding Feng Shui for Loving Relationships, incorporate as many romantic and partner-friendly design choices as possible. If you have a partner this will harmonize and strengthen the relationship; if not, will help you to magnetize one. For example, make sure you have a confortable and big enough bed for two – with two sets of pretty pillows – a tidy (2 persons) couch in the office room, two comfy chairs at the patio… Are you feeling the (two) vibe? Light your home for romance – and this means to throw away fluorescent lights. The purpose is to obtain a calm, comfy, and peaceful ambient. You don’t want to be in the dark neither under an intense lighting. So, look for a mid-term, the one that makes you feel in your special place in the world. Try to understand your own energy and prepare your home for it. If you are a Feng Shui fan, you certainly heard about Feng Shui Bagua map. Therefore, you know that there are specific spaces in your house that need different Feng Shui treatments. 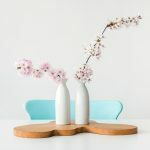 Keeping this in mind, your Love & Marriage bagua area – that is related to the feminine side – has a better energy when is filled with feminine colors. Choose soft pink sheets, for example, and other neutral colors in the decoration (make sure they are harmonized). Don’t forget that in this space you are looking for harmony, confort and (sweet) love. Flowers are known to be powerful romance magnetizers as well as emotion healers. If you don’t know each flowers to buy, be “cheesy” and choose fresh roses (the flower of love). Please don’t buy red ones; ideally, the ones with a soft pink tone (almost white). A photo of your mom, dad, grandparents or brothers and sisters will kill any kind of romance vibe. So, put them on the living room or in a bookshelf on your office room. They are important in other spaces but not in the bedroom. Well, we left this tip for the end, but this is the kind of thing you should do before the work on Feng Shui for Loving Relationships. Clear the home energy, find your way to do this. Put away gifts, belongings or any other thing that brings you some memories of your former partner. They can cause problems with attracting and maintaining a new relationship. It’s an expensive tip, but if you shared a bed with this person, the ideal thing to do is to replace it (otherwise his/her energy will remain in place).